Our next tattooed poet is Laura Mullen, who sent us this photo of a koi on her ankle:. "The fish was a celebration of a book, early on (#2 maybe?) --somewhere before I realized how serious I was about this book stuff? I mean, these days, I think a bottle (or so) of champagne is fine now (I'm glad I don't have 7 or 8 tattoos!) (I have two); I'm more like, Okay that's awesome, another book, now let's get back to work. Can't recall the name of the artist who did the work, sorry…there was some effort put in, as you can tell, and the fish--out of the sun mostly--is holding up well." Laura Mullen is the author of seven books: Enduring Freedom: A Little Book of Mechanical Brides, just out from Otis Books / Seismicity Editions, and The Surface, After I Was Dead, Subject and Dark Archive (University of California Press, 2011), The Tales of Horror, and Murmur. Recognitions for her poetry include Ironwood’s Stanford Prize, two Board of Regents ATLAS grants, a National Endowment for the Arts Fellowship and a Rona Jaffe Award, among other honors. She has had several MacDowell Fellowships and is a frequent visitor at the Summer Writing Program at the Jack Kerouac School of Disembodied Poetics at Naropa. Her work has been widely anthologized and is included in American Hybrid (Norton), and I'll Drown My Book: Conceptual Writing by Women (Les Figues). Undersong, the composer Jason Eckardt’s setting of “The Distance (This)” (from Subject) was released on Mode records in 2011. Mullen is the McElveen Professor in English at LSU and a special interest delegate in Creative Writing for the Modern Language Association. She is a contributing editor for the on-line poetry site The Volta. 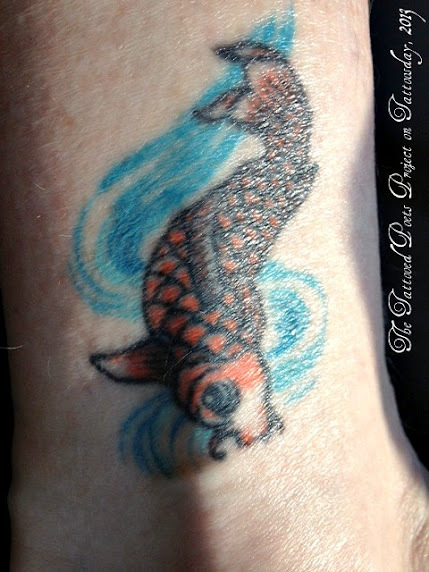 Thanks to Laura for her contribution to the Tattooed Poets Project on Tattoosday!